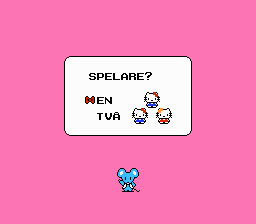 Hello Kitty World is a Famicom remake of the Game Boy platform game Balloon Kid, which is the sequel to Balloon Fight. Unlike the original Game Boy game, which had an original main character, this features the popular Sanrio mascot, Hello Kitty. This translation is based on Suicidal Translations’ translation but the patch should be used with the Japanese rom.